DSG Metro New York collaborated with its vendor partner Indy Audio Labs to showcase the manufacturer's new ACT 4 home theater processor. The Indy Audio Labs ACT 4 is capable of natively decoding 9.1.6 Dolby Atmos, and providing four additional output channels to support 9.5.6 or 9.7.4 configurations. Recently, the Indy Audio Labs ACT 4 home theater processor was demonstrated at DSG Metro New York. 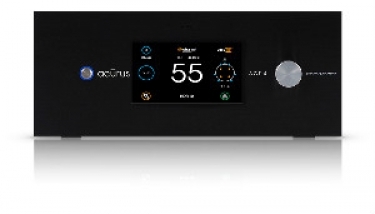 During an event held on Feb. 9 and 10, Joe Smith and Dave Silkin, owners of DSG Metro, demonstrated the newly announced Indy Audio Labs' Acurus home theater processor in a system located in the rep firm's newly remodeled Plainview, New York-based facility. The ACT 4 was used in a system that included an Epson 4K projector, a 175-inch Severtson acoustically transparent screen, and an active dARTS speaker system, and is capable of natively decoding a 9.1.6 Dolby Atmos line-up. The ACT 4 is also capable of supporting four additional channels of audio to enable professional integrators to offer 9.5.6 or 9.7.6 object-based surround systems. "We had a great turnout for this exciting event," states Rick Santiago, co-founder and CEO, Indy Audio Labs. "The ACT 4 performed flawlessly and the reactions we heard to our presentation of high-quality, high-channel count immersive audio where fantastic. Our Acurus ACT 4 has always delivered amazing sound and now with expanded native Dolby Atmos decoding and more loudspeaker outputs, it wins the hearts and minds of everyone who hears it. The fact that it is made in American and costs under $10,000, maks it one of the best values in modern immersive home cinema." The 13.3-channel ACT 4 is available for sale now, and in April Indy Audio Labs will bolster the product through the availability of a 20-channel hardware/firmware upgrade kit. The company explains that the upgrade kit will be available to existing ACT 4 home theater processor owners, and it will be supplied as standard equipment in all new ACT 4 shipments coming from the company's Jeffersonville, Indiana-based factory. Summarizing the demonstration of the new ACT 4, Silkins says Indy Audio Labs improved what was an already good home theater processor. "The theater already sounded fantastic with our Acurus ACT 4. Experiencing the upgrade was eye-opening for all of us here at DSG," Silkin emphasizes. "The immersive experience with six speakers overhead along with wides in front of the room really made Atmos material even more immersive and seamless. The ACT 4 just blows away anything else, especially at under $10K retail."